sarah-jane down the lane: All white now! white so cool and cleansing The grass is turning brown and crispy and the earth is bone dry and I long for the seaside. Everything in the garden seems exhausted with the effort of flowering. A kind of summer malaise is settling over me. 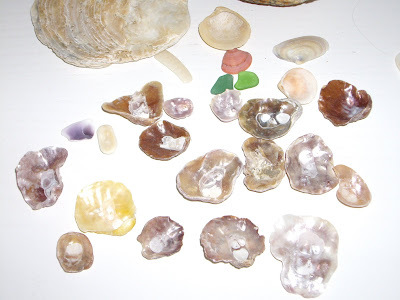 I cant get to the coast this weekend but I can find my stash of pretty shells! I love the simple beauty, the way they have been washed, tumbled and rolled by the ocean. My mind wanders to the beautiful opening sequence of Sense and Sensibility with those gorgeous shots of shells strung and knotted onto string and being blown together by the wind. When I was thinking about this post I also thought about the beauty of the White garden at Sissinghurst, so wonderful but a little out of my league. 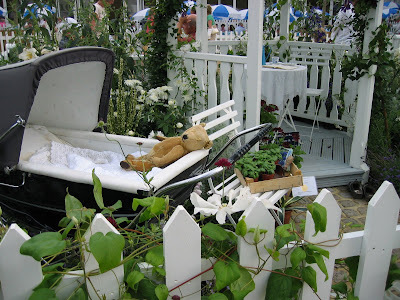 Then I remembered a couple of years ago well three to be precise, I was captivated by this tiny white garden complete with picket fence at Hampton Court Flower Show! Sorry it's not a brilliant photo but I had a job to get it as there was quite a crowd admiring it. I especially like the mini bandstand with table set for tea and the white clematis scrambling along the picket fence. One thing the heat amplifies beyond all else is fragrance. My favourite perfume seems to take on a much more intense persona, the same familiar scent but bigger somehow. In the searing peak of the day I like to pause in a shady spot and drink in the heavy nectar laden smells that pervade the still dry air. This mock orange is almost sickly if you stand there too long! But heavenly to pause for a moment and take it in. All the flowers seem papery and fragileat the moment, if you so much as brush past them they give up the ghost and drop all their petals. I took this photo a couple of Summers ago in Porthscatho. I include it as I am really looking forward to the Home Spun Fair on 2nd August! and beacause I simply adore these flowers they are really quite large in the flesh and I hope that they will be in flower when I visit and someone clever will tell me what they are. I am off to put on a white vest and linen drawstrings and waft my way through the weekend! The white bandstand looks just the perfect for tea and cake on a summers day. Hope you have a cool weekend. 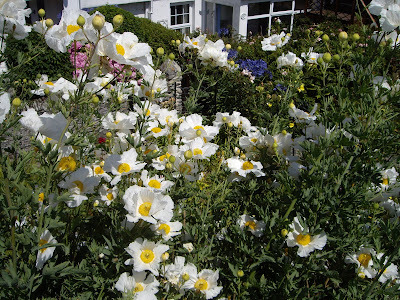 I am not sure .. but I think those white flowers are either a Cistus or Anenome of some sort.. but then again they look like a type of poppy.. Sorry... that's not much help to you! I think it is a cistus plant, a "rock rose". I use to have one in bright pink, never seemed to like my garden but apparently prefect for seaside gardens.